I spent a thoroughly enjoyable day yesterday cycling along a segment of the ‘Sea to Sea’ route with my friend David Chadwick. We started out near Durham, taking the old railway path up to Langley Park. Then we rode over a hill to Waldridge, before taking a forest track to Pelton where we caught up with the ‘C2C’. Part of the brilliant National Cycle Network, the C2C runs from Whitehaven on the Cumbrian coast all the way to Sunderland’s Roker Beach. Much of the route is on segregated cycle tracks, often converted from disused railway lines. The section from Pelton to Sunderland that we rode yesterday was almost entirely on old railway lines. 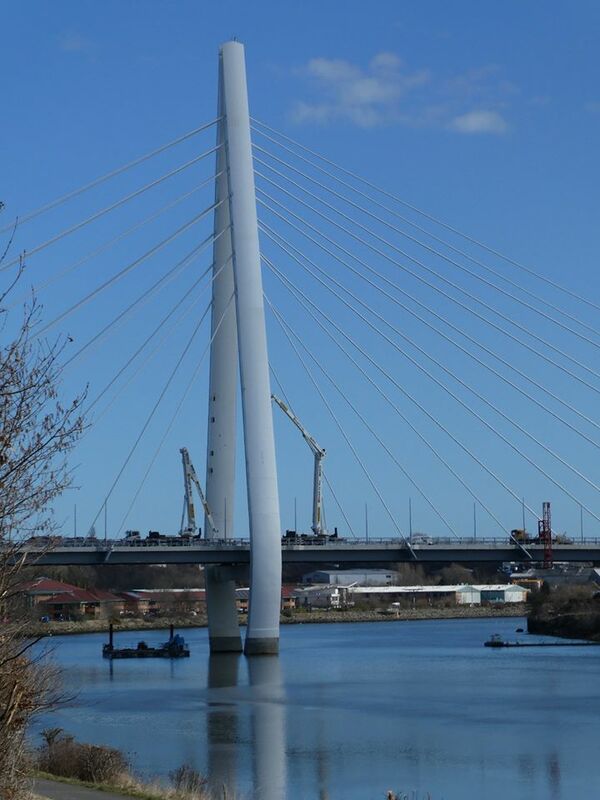 Highlights included passing Sunderland’s new Northern Spire Bridge (pictured below) and the Stadium of Light, and riding along the River Wear. Magically, the C2C takes you right into the heart of the city along the riverbank – all the way to Sunderland Marina and Roker Beach without losing sight of the water. Wonderful! But perhaps the most pleasing thing about the C2C is how well signed it is. There are clear, prominent blue signs at every junction, making it easy to avoid getting lost. The volunteers who maintain the C2C's signage – not to mention whoever thought of the route in the first place – deserve huge credit. All of which got me thinking – why can’t we create something similar in London? People are always talking about the so-called ‘cycling revolution’ in the capital. Many hundreds of millions of pounds have been spent on improving London’s cycling infrastructure over the last few decades, but the truth is cycling remains a minority activity in the capital. On the C2C I saw people of all ages and abilities. And there’s a reason for that. The route and the signage are of such high quality everyone has the confidence that they can get safely and simply from A to B – on a 140 mile stretch of route. There are thousands of miles of quiet cycle routes in London. The London Cycle Map Campaign is calling for a system of signage and a corresponding map to enable people to navigate those routes safely and simply. With a bit of imagination from the authorities, London could be criss-crossed with routes of similar quality to the C2C. Cyclists of all ages and abilities could consult a Tube-style London Cycle Map and then follow coloured signs to get from anywhere to anywhere in the capital on dedicated cycle routes. It would be a cycle network that truly revolutionises transport in London. For me, the C2C was an inspirational route in more ways than one. What is a police officer’s job? Call me old-fashioned, but I thought it was to catch and deter criminals. How naïve can you get! Indeed, this afternoon my naivety was the subject of some determined remedial action on behalf of Her Majesty’s constabulary. I was sitting in a café doing some work when a police officer came in and loudly inquired as to the owner of the bicycle resting on the wall outside. I indicated that the bike was mine, whereupon the officer strode over to my table and declared: ‘your bike is not secured’. I replied politely: ‘yes it is; there is a lock on the wheel’. As far as I’m concerned, this was ample security in the circumstances. I go to this same café nearly every day, and, each time, I leave my immobilised bike in exactly the same place, where I can see it through the window, five yards away, on a busy pedestrian thoroughfare in a small and pleasant provincial British city in broad daylight. At other times and in other places, no doubt, it would be sensible to lock a bike to an immovable fixture. But on this occasion there was really no need. The officer, however, saw things differently, legalistically, as it were: ‘your bike is not secured to a fixed point; you need to secure your bike properly’. At this moment, I confess, a gremlin of irritation began leaping around in my breast. My voice shaking very slightly, I responded: ‘My bike is perfectly fine as it is’. Sensing my irritation, the officer decided to up the ante by attempting to boss me around: ‘Go outside and secure your bike properly, please!’. There was only one way to respond to this. And with that, I theatrically turned my eyes back to the book I was reading. Alas, the officer had no intention of withdrawing so easily; she was now quite indignant herself. She barked: ‘Excuse me, I’m talking to you. I’m asking you to go outside and secure your bike properly, otherwise you’ll come running to us when it gets stolen’. ‘And I’m asking you to leave me alone and do your job properly’, I retorted. This remark clearly hit a nerve. The officer proceeded to implore me to ‘work with her’, because she was part of a ‘task force’ aiming to ‘reduce theft in our area’. I pointed out the obvious: ‘you’re not reducing theft; you’re hassling me’ (an activity which she probably assumed would be easier than real policing). By now, almost everyone in the café was listening in on our conversation. It was time for a finale of sorts. The police officer attempted to make one last flailing bid for the moral high ground, to secure one thing if nothing else, namely, the pre-eminence of an insidious collectivist ideology according to which crime is always the responsibility of everyone; perhaps she had learned this ideology in police school. ‘You’re not helping this city!’, she intoned. Then she stormed out in a huff. Not helping this city, indeed! Simon Parker has created an updated road map showing the underlying network of cycle routes and other roads that are represented on his London Cycle Map. If you want to see the exact roads (and parks) that are incorporated into Parker’s London Cycle Map, click on the ‘satellite’ icon at the bottom of the menu on the left of the road map. The road map of the LCM routes is a very useful resource – both currently and potentially. Currently, it can be used by technically-minded people – planners, campaigners, politicians, or informed laypeople – who want to find out more about the exact measures Parker is proposing (although please note that there are discrepencies between the road map and the various versions of Parker's London Cycle Map: his route choices have evolved over time). Parker’s London Cycle Map seeks to make the best use of the capital’s existing cycle infrastructure (including Cycle Superhighways, London Cycle Network routes, National Cycle Network routes, and many more) whilst also informing decisions about future cycling investment. There are numerous places on Parker’s proposed network where investment is essential – including various new route sections and new bridges. On the road map, Parker has helpfully divided new route proposals into two categories – easy and difficult. ‘Easy’ means there will be scant physical or political obstruction; ‘difficult’ means such obstruction will, most likely, be more significant. Nobody should be put off by Parker’s development proposals. A major question in cycle campaigning is how best to spend available funds. The centrepiece of Parker’s project is his conviction (which I explain here) that new cycling investment in London will tend to be most impactful when it contributes to a network of signed and mapped cycle routes. Potentially, Parker’s road map (or something similar to it) could also help cyclists plan journeys. At present, the network is incomplete; so Parker’s road map should not be used as a route planner. However, on the back of sensible decisions being made about the development of Parker’s network, road markings and signs should be positioned on the streets corresponding to his London Cycle Map. The signs and markings would enable cyclists to follow the routes on Parker’s network; in turn, this would enable people to cycle from anywhere to anywhere in the capital by following (in most cases) just a few trails of colour. Obviously, this would be a huge improvement on the present situation, wherein a journey across the capital requires cyclists to remember hundreds of turn rights and turn lefts. Perhaps you’re looking at Parker’s road map and thinking: it looks very complicated! You’d be right! The point is, London’s cycling infrastructure is extremely complicated – a vast, tangled spaghetti of routes. Parker’s road map is, in fact, an ingenious simplification of the current network (pending the addition of a few new routes), carving it up into long straight coloured routes that dissect the capital in every direction; he calls this the 'Compass Colours system'. (Incidentally, the ‘white’ layer on Parker's road map displays cycle routes that are officially recognised but do not fit readily into the Compass Colours system). In turn, the London Cycle Map proposes a way to simplify Parker's road map. The LCM would be cycling's equivalent of the London Underground Map. When you catch the Tube, you need to know how to get onto the network to begin your journey, and how to get from the network to your final destination; but, while on the network, the signs guide you along. The same would apply to using Parker’s London Cycle Map. 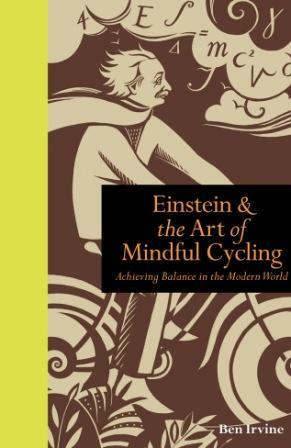 Cyclists would only need to consult his road map to establish how to reach the network at the start of a journey and how to reach a chosen destintion from the network. While on the network, signs would guide cyclists along. What a wonderfully efficient and user-friendly way this would be to organise the capital's unwieldy tangle of cycle routes! In fact, often cyclists wouldn’t need to consult Parker's road map at all. Typically, they’d already know how to get onto the network, because they’d be starting from home. And venues might supply directions explaining how to get from the network to the venue, just as they typically supply directions explaining how to get to the venue from the nearest Tube station. However, it should be repeated that, due to the current incompleteness of the network, Parker’s road map is not designed to be used as a journey planner at this stage. Simon Parker’s road map points the way forward for cycle campaigning and cycle development in London. We already have an extensive network of cycle routes in the capital, so why not make these routes easier to find and follow? Why not spend the available cycling development funds on completing and improving the current network? Why not create a single London Cycle Map and network of signed, coloured routes, potentially enabling Londoners to cycle from anywhere to anywhere in the capital, without hassle or hindrance? That’s what the London Cycle Map Campaign is calling for. Please support us by telling your friends about our campaign, and by signing our petition. Buy Scapegoated Capitalism from Amazon here. BOOK SUMMARY: Scapegoating is one of humankind’s most unpleasant and unspoken practices. From witch-hunts and whipping boys to ritual sacrifices and genocides, our past abounds with shameful examples of individuals and minorities being forced to atone for the misdeeds and misfortunes of the powerful. In this groundbreaking book, philosopher Ben Irvine explores the history and psychology of scapegoating, identifying the tragic forces that tempt us to make culprits of the innocent. In turn, Irvine shines a spotlight on the shocking prevalence of scapegoating today. Confronting popular misconceptions about the source of our modern ills, he makes a compelling and controversial claim: that those who are the most vociferous in their condemnation of modern life have the most to answer for. A book for our times, from beyond the pale, Scapegoated Capitalism is a call for self-examination and responsibility. You pay the wages (through your taxes) of millions of public sector bureaucrats in Britain. I mention this, because most British people seem to be a strangely indifferent towards the fact that public sector bureaucrats are supposed to provide a service to taxpayers. As for the bureaucrats themselves, they seem to be not only indifferent to providing service but resourcefully opposed to doing so. Last week, I rode my bicycle into a signpost which had been helpfully positioned in the middle of a segregated cycle path in Cambridge, where I now live. The cycle path goes against the flow of traffic. As a consequence, in the evening the oncoming car headlights dazzle cyclists along this stretch. It was evening when I crashed, and it was raining. I simply didn’t see the signpost until – BANG. Luckily, my shoulder took the impact and not my face. I’m still limping from landing on my knee. The signpost was positioned far from any lampposts which would have provided illumination, and was itself unlit. It had been installed quite recently I believe, to warn drivers of the cameras that have recently been installed in a bus lane along the same stretch of road. You’ve gotta love the council. The next day, I tried to contact the council’s highways department to inform them that their latest money-making scheme was dangerous to cyclists. The only mechanism for supplying feedback was an online form accompanied by a dropdown menu of topics for complaints (‘Potholes’, ‘Broken Signs’, etc). There was no category for ‘Profiteering Road Signs Erected in Stupid Places’, so I opted for ‘Broken Signs’. You never know – my shoulder took quite a whack, so hopefully the reverse was true also. To my dismay, the poxy little online box in which I was supposed to write my complaint was even more severe than Twitter in its demand for brevity, so I gave up trying to explain my accident in the form of a haiku, and attempted to phone the Council instead. By now, my head was filling up with prose. After much reverberating around in automated phone space, I got through to someone who informed me that I should try emailing the council about the problem. I asked my interlocutor what his name was. He said ‘Matt’. I replied, ‘full name’. Believe it or not, I wasn’t trying to be friends with him. He said ‘Matt... [something or other]’. I can’t remember already. The ravages of time. Anyhow, I sent a message to the impersonal ‘highways’ email address that Matt had given me. My message carefully explained that the signpost which I crashed into was dangerous. And then something amazing happened. I received a prompt reply! Alas, my delight lasted a matter of seconds. The reply was an automated message from the friendly-sounding email address ‘Do-not-reply@cambridgeshire.gov.uk’. The not-to-be-replied-to-reply (is there a double standard there?) informed me that I could ‘track the status of this fault at any time’ on the council’s ‘Fault Tracking Page’. Is that better than talking to a human (whose wages I pay) about the signpost I had crashed into? Only one way to find out. I clicked the link, and found a page telling me that the ‘status’ of my fault was ‘Reported’ (Does a fault have a ‘status’? An interesting philosophical question). Well, at least I hadn’t completely wasted my time – I was the proud author of a Report. This gave me such an inner glow, I was almost willing to overlook the fact that I hadn’t reported a ‘Fault’, as such, rather a poor decision with dangerous practical consequences. Still – who cares what words mean? In any case, the Fault Tracking Page reassuringly informed me that ‘Within 10 days we aim to decide whether further action is necessary’. An aim! An aim to make a decision! This was real action being taken based on my complaint. I was ecstatic. I was so ecstatic, I turned a blind eye to the fact that the ‘Description of Fault’ as recorded by the council consisted of a truncated block of text lifted from my initial email. The text had been cut off mid word, as though I was a contestant in a sort of bureaucratic game show. Ah, the curse of the poxy little online box again, only this time the poxy little online box had come to me. Well, the 10 days have now elapsed. Did the council succeed in their aim to make a decision? I don’t know. I haven’t been contacted. Rather enigmatically, the Fault Tracking Page also informs me that ‘Where no further action is considered necessary, the person reporting the fault will be informed and the report will be closed’. So, can I conclude from the fact that I wasn’t informed that the report hasn’t been closed? Can I conclude that further action is considered necessary? Can I conclude that considering further action necessary is the same as taking further action? I simply don’t know. Indeed, I don’t know what it means to ‘close’ a report. Does it mean ignoring the fact that there is an invisible signpost in the middle of a cycle lane? And I don’t know what ‘further action’ means. Does it mean further to the aim of deciding? Or further to sending me an automated email? Who knows. Matt the council employee didn’t want me to know his full name because Britain’s public sector bureaucrats are pathologically unable to take responsibility for anything. They take our money, then they hide behind automated systems. Credit where credit is due, these automated systems are quite brilliant at protecting public sector workers from the consequences of their actions. Our money, in other words, is spent on ingenious ways of making that sure our money is never spent accountably and wisely. That, dear readers, is the invisible signpost that democracy is about to whack slapbang into. Sorry this is ridiculously late notice. I was interviewed earlier this month by Eddie Nestor on BBC Radio London's Drivetime. The subject of the interview was London's Cycle Superhighways. The interview can be found here (at 01h 12m 24secs, when Eddie's short preamble begins). The audio is only available online for the next 8 days. When I was a little kid in London one of my very favourite activities was hitching a ride on the back of my Dad’s bicycle in a child’s seat. I can still remember the feeling now, a sense of exhilaration and security all rolled into one, as my Dad swept through streets and parks, and the wind swept through my hair. They were more innocent times, when people’s lives seemed somehow to be more practical yet more fun. But in Cambridge where I live today, it seems that those days are returning. I’ve noticed more and more local parents ferrying their younger kids around by bike. Particularly popular are those bicycle trailers that attach to the rear of an adult bike. They look like mini lunar modules, fully covered over, with transparent plastic windows, so the little ones can be snug inside but curious about the world outside. Of course, on the continent the bicycle school run is nothing new. In many European cities, in the mornings and afternoons on schooldays you’ll see cargo bikes weaving past in their thousands, with thousands of tiny smiling faces in tow. But what is different is a new sound emanating from those legions of bicycles. It is the faint sound of whirring – the sound of an electric motor. Europeans, it seems, are increasingly taking the logical step of equipping their cargo bikes with an electric motor, to help carry the load. Electric bikes in general are one of the continent’s biggest growth industries, due to the incredible potential of the latest ebike technology. With a battery-powered motor providing extra oomph as you pedal, the bicycle (already a miraculous machine) becomes a veritable super-bicycle. Naturally, the power of this new technology is attracting even greater numbers of parents to the cargo bike school run. Cargo bikes have many other positives, some less obvious than others. Clearly, you can save a lot of money by biking the kids to school, while deriving all the familiar health, fitness and psychological benefits of cycling, including greater happiness and productivity. But Eddie tells me, interestingly, that he is also pleased that he is giving his daughters some experience of the road; ‘I feel they are too young to cycle along a busy roadside, yet they’re getting a sense of how it’s done’. And schools, too, seem to be benefitting from bicycling parents. Bikes improve road safety outside the school gates, by reducing gridlock at the start and end of the school day, so schools are going out of their way to encourage cycling. Eddie tells me that some of the parents who cycle their kids to school on the way to work choose to detach their trailers and leave them at the school, then continue on to work, then pick up the trailers and kids on the way home. Cargo bikes, it seems, are increasingly being woven into people’s lifestyles in Cambridge; you only have to look around to see the evidence. ‘I call it Camstersdam’, exclaims Eddie, making reference to the city of Amsterdam, where the cycling school run is world-renowned. But – I ask Eddie – realistically, aren’t many people likely to be put off by concerns about getting too sweaty or too tired on a bike, especially with one or more kids in tow? ‘That’s where ebikes come in’, Eddie responds, nodding. ‘Not everyone has the fitness levels necessary to be able to bike the kids to school on a conventional bicycle, day in day out – for example, recent mums, or, in general, parents who are just downright exhausted by raising kids’. So, what difference does the electric motor make? ‘A massive difference. You’re in control of how much effort you put in. You can toggle the assistance level, allowing the motor to do most of the work, or you can put more effort in yourself. It’s up to you’. There are various options when it comes to electric cargo bikes. The Electric Transport Shop can install a battery and motor onto a cargo bike that is already owned by a customer. ‘“Dutch bikes” are a popular option for upgrading’, says Eddie. Another excellent option is the Smarta bike which is available directly from the Electric Transport Shop. This award-winning ebike is extremely robust and reliable (I know this because I personally own one) and perfect for attaching a trailer to. ‘We offer a £999 Smarta bike-plus-trailer deal, along with a free service within 300 miles of usage of the bike’, explains Eddie. Going forward, he informs me, an ebike service is recommended for most users just once a year, and 83% of customers get over 5 years of usage out of their first battery. And here’s the best bit: the electricity is likely to cost less than £5 per 1,000 miles. ‘You can also use an electric cargo bike to transport your dog and your shopping’, continues Eddie, who is clearly passionate about these wonderful machines. He invites people to come to the Electric Transport Shop – which has stores in London, York, Bristol, Oxford and Cambridge – to find out more. You could pick the kids up from school afterwards. Being a writer is great. It means I get to work long shifts as a delivery boy, in a precarious effort to stave off the ever-present threat of financial ruin and starvation. But I’m not kidding; I really do enjoy doing deliveries – curries, in my case. Before you jump to any smutty conclusions, I don’t do the job for the alleged romantic perks (my name’s Ben, not Sven). I love doing deliveries because it means I get to ride my ebike – and get paid for it! Earlier this year I purchased a second hand ‘Smarta’ ebike from the Electric Transport Shop in Cambridge. Since then I’ve been using it to do local deliveries five evenings a week. The ebike has been an absolute revelation, especially to my car-driving colleagues. I can get around town much quicker than they can, partly because I can weave through the traffic, which is notoriously heavy during the evening rush hour in Cambridge, and partly because I can utilise short-cuts and more direct routes that are only accessible to bicycles and pedestrians. Being on an ebike also enables me to scan house numbers a little bit more easily than a car driver can, and I can park on the pavement directly outside the customer’s front door. So in the time that it would take a driver to locate the house then find a suitable parking space then park in it, I’ve already dropped off the food and left. And, more often than not, I leave with a tip in my pocket; the customers seem to really appreciate my ebike. Obviously, compared to a car it is more ecologically friendly, less polluting and more community-spirited, all of which helps capture people’s interest, but they’re also just keen to find out more about the ebike itself. I’m always happy to show off its specifications. Smarta ebikes have five power settings, corresponding to increasing levels of assistance when the rider pedals; on number 5, it’s like getting a push from Usain Bolt. In addition, there’s a throttle on the handlebars (like on a motorbike), which provides even more oomph, so I can zip safely away from traffic at the lights. I keep a spare battery back at the kitchen, so when the first one runs out, I swap them over, and charge the original. They last for 25 miles or so, and are easily detachable. Costing £1110 as new, Smarta ebikes are sturdy, which is important when you’re navigating bumpy streets (that’s a hint, Cambridge County Council), yet stylish, too – mine came in a bright shade of cyan, which really offsets the elegantly curving frame. I frequently notice pedestrians doing a double-take when they see me cruising nonchalantly past; I know they’re thinking, *wow, what is that cool vehicle?*. Naturally, I bask in the reflected glory. Of course, my boss, too, loves the ebike. He is enthused by its potential to save money as well as time. At the moment, he spends over £1000 a month on transport fuel costs. With a fleet of ebikes instead of cars, using electricity rather than petrol, that figure would drop to about a fiftieth of its current size; yes, you read that right. Our company already employs a handful of cyclists on conventional bikes, for round trips of a few miles or less, but ebikes could extend that cyclable range across the whole of Cambridge. In moving over entirely to bikes or ebikes, we would also extend our pool of potential employees; not everyone has a driving license, especially among the students and artistic ne’er-do-wells like myself for whom causal evening work is attractive. A further general benefit of using bicycles is that their storage boxes (fixed to the rear racks) can easily be emblazoned with free advertising, which obviously creates a positive impression – apart from when, very rarely, members of the public ring up to complain about the conduct of our cyclists on the road. One guy rang this week to say that when he was in his car one of our company bikes, whose rider was wearing earphones, had “cut him up”. Don’t get me wrong, I never, ever wear earphones when riding, and I don’t think anybody should, but I couldn’t help chuckling when the furious driver said of our cyclist: “he couldn’t even hear me swearing at him”. So I guess earphones do have occasional advantages. I spoke to the Electric Transport Shop’s co-founder Eddie Kehoe about the appeal of ebikes to delivery companies. ‘There are so many financial pressures on businesses these days’, he explains, ‘everyone is looking for a way to control their outgoings. Ebikes are a simple but powerful way to drive transport costs down’. Or, indeed, to ride them down. Now with stores in five British cities, the Electric Transport Shop has supplied ebikes not just to numerous delivery companies but to other businesses with employees who need to be out and about during office hours. ‘The ebikes industry is taking off’, declares Eddie, pointing to the range of prices, features and models (and also etricycles) now available from the Electric Transport Shop; ‘some of the world’s biggest companies, including Panasonic, Bosch, Yamaha and Shimano are now competing for a share of the market’. It seems strange – indeed, fantastic – to think that they now have a growing role to play in the takeaway food industry too. Moreover, ebikes seem to be generating not just efficiency but innovation within that industry. One company that Eddie has worked with is rewriting the rules of takeaway food, as recently reported by the BBC (look out for the Smarta ebike in the video!). Founded by Will Shu, ‘Deliveroo’ uses mobile internet technology to connect customers, deliverers and kitchens, thus enabling restaurants – both large and small – to offer a delivery service when they wouldn’t otherwise have done so. ‘In our platform’, Shu explains, ‘all they have to do is cook the food and we take it and bring it to people, which means that a) we can work with a higher class of restaurant, and b) the delivery times are much faster’. Key to the operation is the company’s use of ebikes, with their speed and flexibility. When Deliveroo hired a fleet of Smarta ebikes from the Electric Transport Shop, South East Regional Manager Jeremy Rawlinson was impressed: ‘The Smarta ebikes were very reliable, as was the support we received from the Electric Transport Shop, fitting into what we're doing as a company and helping us provide our top class service’. Deliveroo riders are rapidly become a familiar sight in cities including London, Brighton, Nottingham, Edinburgh and Cambridge. More and more people, it seems, love ebikes, but none more so than me. It’s not just about the practicalities, although I do particularly enjoy not having the hassle or expense of buying insurance or road tax; ebikes are exempt from both. Above all, what I love most about my Smarta ebike is how exhilaratingly fun it is to ride, and how enjoyable it makes my (proper) job. If you’ve never ridden an ebike, try it. You’ll wonder why you spent so many years stuck in your nose-picking cage of a car, waiting for the traffic to shunt a few metres forwards. And you’ll wonder why you ever waited so long for your takeaway on a Friday night. The Electric Transport Shop has stores in London, York, Bristol, Oxford and Cambridge. For more details see www.electricbikesales.co.uk. How can Cambridge's worsening congestion problem be solved? A decade ago, two friends who met at university in the city reckoned they knew the answer, and set about making it happen. Ten years on, it seems that more and more local residents are agreeing with them. I spoke to Eddie Kehoe about the business he started with co-founder Jamie McAlley out of a garden shed in Cambridge. Today located on Newmarket Road next to the Elizabeth Way roundabout, the Electric Transport Shop is doing a roaring trade selling ‘electric bicycles’, with newer branches thriving in four other British cities. What is the secret of this company's pioneering success? I could hardly disagree; I've been a huge fan of e-bikes ever since I bought mine a few years ago. Basically, e-bikes are conventional bikes supplemented by a battery-powered motor. Depending on the model, the motor can be engaged by pedalling, or by a throttle (as on a motorbike); either way, the extra oomph comes in handy when climbing hills or accelerating. The great thing about e-bikes', Eddie continues, 'is that, when you find the right e-bike for you, you get all the benefits of conventional cycling but you’re more in control of the downsides, such as getting sweaty or tired'. So does this mean that you get less exercise on an e-bike? Not exactly, Eddie explains. 'Studies show that people tend to use their e-bikes more than conventional bike owners use theirs – so, overall, e-bike owners tend to get more exercise'. It also seems that e-bikes are increasing the popularity of cycling. Perhaps people feel more confident because the motor helps them nip more quickly away from traffic, or avoid what Eddie calls 'low-speed wobble'. Whatever the reason, studies show that e-bikes tend to widen the appeal of cycling. For people of limited mobility – including disabled people or ME sufferers – owning an electric bicycle (or tricycle) can be particularly life-changing. Eddie recalls one customer, a gentlemen who weighed 30 stone, who managed to shed 5 stone in a year after buying an e-bike. Remarkably, he now rides his e-bike around velodromes as a pace-setter in races! What does the future hold for the Electric Transport Shop? ‘New stores are planned in more British cities’, explains Eddie, adding that the industry in general is growing rapidly, with manufacturing giants such as Bosch, Yamaha, Panasonic and Shimano now competing for a share of this exciting market. But Eddie is particularly passionate about the e-bike's potential for transforming Cambridge, where he lives with his family. ‘Everyone is fed up of the noise, pollution and stress caused by the city’s congestion. It’s encouraging to see that public transport infrastructure improvements are being discussed. But e-bikes are a simple, affordable and increasingly popular solution – they are a continuation of Cambridge’s long and proud tradition of cycling, after all’. The figures certainly stack up. Most e-bike batteries last between 20 and 40 miles on a full charge. So, pretty much any journey within the city could be undertaken on an e-bike. Likewise, residents of surrounding villages could easily get in and out of town on e-bikes. Slightly further afield, commuters could recharge their batteries while at work – a full charge usually takes three or four hours, and the batteries are easily detachable. The e-bikes themselves vary in price – from £699 to several times more, with various monthly payment options available, including an interest free option over 24 months. Current prices are attractive, but, in any case, for many people, the cost is redeemed by money saved. The average Briton spends around £90 on petrol each month. So, some e-bikes pay for themselves within a year – and then bring many more years of savings. The savings are even more impressive for the various businesses that Eddie has supplied with a ‘pool’ of e-bikes for the use of employees who need to travel around Cambridge in the course of their jobs. As for the cost of the various possible new transport initiatives proposed for Cambridge, including several new train stations, a new Park and Ride scheme to the east of the city, and a guided busway route south of Madingley Road, figures of hundreds of millions of pounds are being talked about, not to mention the possible environmental costs that can be associated with large-scale developments. Let’s put this in perspective: the local authority could buy every Cambridge resident an e-bike for much less than the probable total cost of all the new schemes. But why wait? Perhaps the best thing about e-bikes is that they are a great way for individuals to solve their own transport problems, to gain greater freedom and convenience, and save money, while also making a positive contribution to the local area. We don’t have to wait for the authorities to take steps to reduce congestion; we can make a difference too. That’s a fitting ethos, I think, for a company founded ten years ago by two entrepreneurs who are changing Cambridge for the better, one grin at a time. Find out more about electric bicycles and tricycles at www.electricbikesales.co.uk, or pop into the Electric Transport Shop located at 118-120 Newmarket Road, Cambridge. See the website for details of other UK stores. A cycle network for wheelchair users? 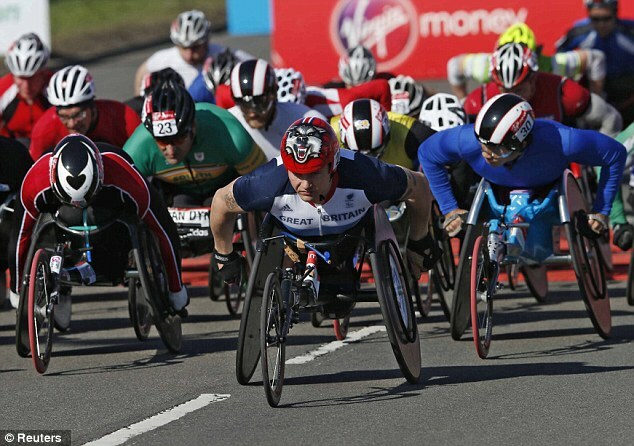 Sitting here on a lazy Sunday morning watching the London Marathon, I find myself marvelling - amid many things - at the athletes who are swooping through the capital's streets in the wheelchair event. The speed and efficiency of those machines (let alone the athletes) is really impressive - did you know that the world record for the wheelchair marathon is under 1 hour 20 minutes? With all the difficulties that must exist for wheelchair users when travelling across the capital on a normal day - busy buses, trains and streets are, alas, not the most hospitable environments for a wheelchair - I can't help wondering if people ever use their wheelchairs as a mode of transport comparable to a bicycle - i.e. as a vehicle for commuting, getting to the shops, visiting friends. Perhaps there are legality (or safety) issues involved in using a wheelchair on the road - can anyone englighten me? - but I don't see why in London we can't build a network of quiter routes that are suitable for cyclists, wheelchair users, mobility scooters, and more. Regardless of the ideological ravings of many cycle campaigners, it would be better, on the whole, to build such a network away from the capital's main roads, with their large volumes of buses, trucks and pedestrians. A network of quieter streets, parkways and canals would be a sanctuary where the most vulnerable road users wouldn't feel - or be - vulnerable. That microcosm of routes could extend like a system of capillaries throughout the whole capital, creating a safe connection from anywhere to anywhere. You may think I'm a dreamer, but to some extent my dream is already a reality. There are already thousands of kilometres of quieter cycle routes in the capital; a London Cycle Network which, up until the turn of the millenium, was being developed by enlightened planners. Sadly, in the cacophony of moral and political grandstanding that surrounds today's calls for 'cycle superhighways' and 'space for cycling' on main roads, the London Cycle Network has been almost forgotten. It waits forlornly in the margins, undervalued and underused. One of the biggest reasons for this marginalisation is that the planners who created the London Cycle Network didn't get round to creating a decent map and system of signage for its routes. While in theory you can get more or less from anywhere to anywhere in the capital on those routes, in practice you get lost. Ludicrously, there is no single map showing how the network connects together, and on the network there are hardly any signs. The London Cycle Map Campaign is calling for a Tube-style map and network of safe, quiet cycle routes in the capital; much of this network should include the current London Cycle Network. We want cylists to be able to consult a single map of routes and then follow those routes by following regularly-spaced, highly visible coloured signs and surface markings. This map and network would provide a direly needed alternative to the status quo. Instead of remembering hundreds of turn rights and turn lefts to get to a destination, or venturing onto the capital's major transport arteries, London's cyclists could get wherever they want to go, simply and easily, in a stress-free, specially dedicated cycling environment. And, sitting here watching those wheelchair athletes streaming through the capital, I don't see why a London Cycle Map and network shouldn't be for them too, and many more like them. Let's enable all Londoners to access the convenience and joys of a Tube-style map and network of colour-coded cycle routes. Read more about A cycle network for wheelchair users?